I haven't eaten this candied fruit for a very, very long time. In fact, I can't even recall what the fruit looks like. This fruit is native to Southern Tagalog if i'm not mistaken. Also, we have a Rimas fruit in our backyard in the province. 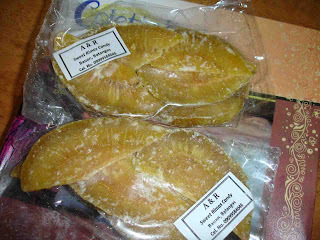 Rimas is also known as Kolo or Breadfruit. It's similar to Kamansi, and a relative of Jackfruit (that's Langka). So aside from being turned into candies, some also makes a dish out of it using gata or coconut milk.